we'll have to look at fabric! Anyone feel like cutting into these? Japanese fabrics, flannels, & home dec not included. Just leave a random comment to enter. I love the Pam Kitty! I love all of your fabrics, I want them all! All are very pretty, I hope to have chance ! I need some of those scissors in my life! Anyone have any snow they don't want?? Please send it my way. Ah-fabric, you are one of the loves of my life. Just beautiful fabrics-hard to choose! I'm sooo tired! mmm original? Thanks Corrie. Oh goodness, SO MANY gorgeous fabrics! Here is my random comment. :):) That scissors fabric is so cute! Thanks, Corrie! They are all such lovely fabrics. I would love the chance to win. I don't use the Google account. That's a great giveaway, I need some ruby! Someone is going to have a very hard time picking out fabric! Beautiful fabric! All yummy goodness to pick from! Decisions, decisions!! Thank you for the chance. Wow it all looks scrumptious. Thank you for the lovely giveaway. Oh what a lovely fabrics design and bright colors!! I would love to win some...thanks for the great giveaway!! All the fabrics look like "SPRING"! We live in an area of the northeast that is having a warm winter so it actually almost feels like spring here. Now that I have written that we will probably have a major snowstorm next week! Oh so many pretty fabrics! All so pretty. I'd love to win, since I'm trying real hard not to buy any fabric until at least February. I think I can make it that long. Short term goals, right? I've got Anne Kelle's new line but I am mooning over the scissors line. Fabric is just delish! I love looking at the variety and it's hard to resist sometimes! I love,love,love the scissors fabric! I wore black while sewing yesterday, then realized when I went to pick up the kids that I had brightly colored threads clinging all over me.... (random but true). All of these fabrics are so beautiful. Thanks for the opportunity to win! When you ask for a random comment, I wonder how random you really mean for it to be. Ha ha. Where I live the temperature is higher right now than the expected high for tomorrow. Tomorrow the weather forecast is for a snowstorm in my area. Sounds like a great time to stay in and sew! I love all the beautiful colors! I would love to add these to my stash! Those fabrics are so adorable! I am in need of primary color boy fabrics; got any of those? Thanks for the giveaway! What happy fabric! I always love the choices you have for your Thursdys! You both have a good eye for color! I need more of those cheery fabrics to go with my stash. Thanks for the chance. Random comment. :) All of those fabrics are lovely. Thank you for the chance. Oh I love fabric! Thanks for the chance to win! I saw mermaids--I'm currently "collecting" mermaid fabrics, so I would have to choose that. Thanks for the giveaway chance. Lovely fabric! Rich colors. Thanks for the chance to win! Have a wonderful Thursday! You have such great fabrics. It would be fun to choose 2 for a giveaway. Happy Sewing! Your giveaway fabrics are always so cheerful...Love it!!! Thanks for a chance. The fabric's made my day, so cheerful. Excited about a chance to win one of them! Those first 2 collections are fabulous! It's snowing outside and it will be a housebound day but those fabrics make me feel sunny! Such yummy fabrics, you have such great taste! SO much cuteness... love the Pam Kitty line. Thanks for the chance to win! They are all so beautiful, what a tough choice. I hope I win! How exciting! Love those tiny fun prints that seem to scream joy ...what a delight they would be to have. These are so bright and cheerful! Makes me wish for spring! Thanks for the generous giveaway. The fabrics are a cheery bunch. Wow maybe I could win instead of shopping at your store. I love all your fabrics. Ooh, such cheery fabrics! Brightens my day! my daughter would love all those cheery fabrics. thanks for sharing! I love all your fabrics and giveaways! Thanks! Wow, love them all. Thanks for the chance to win!! Oh my goodness.. those happy fabrics.. they are delightful. They sure would make me happy! What fun! Thanks for the giveaway! They are all great fabrics! But then again, don't think I've seen too many fabrics that I don't like :) Thanks. Love the scissor fabric. I collect scissors & this would be fun to make something for the sewing room with. Great fabrics, I would love to win Pam Kitty. gasuski@mac.com. Wow I am falling in love with all this new eye candy. just not enough hours in a day to get it all sewn. So I just pet it some days. I think it would take me hours to choose just two of those yummy fabrics shown in today's post! ok, i'm not allowing myself to enter any giveaways, but i AM collecting fabrics for my pink-rainbow-i-spy-twin-quilts-for-my-girls... so i think this open-ended contest at an awesome store counts, don't you? Wow, what a bonanza of fabrics to choose from! Thanks for the opportunity to win. I'm in LOVE with the scissors fabric! What a generous giveaway. Gorgeous fabrics. Thanks for the chance to win. Love those little scissors! And who wouldn't love one Japanese fabrics! Thanks! Love the fabrics today. The bright colors are sure "sunning" up a dreary day. Thank you for the chance to play! I love the Pam Kitty line and am using it in my Farmer's Wife Sampler blocks. Thanks for sharing! Such a fantastic giveaway, thanks!! The only problem would be that if I won, i'd have to choose only 2! Those fabrics are so fun! Great giveaway. More fabrics = more fun! oh... I could never have enough fabric... make make make! thanks for the chance! i could use some more fabric... hehe..
Beautiful! I love the Pam Kitty, and the Half Moon Modern Scissors. Thanks for the giveaway! Love these fabrics. They look so bright and fun in the photos! 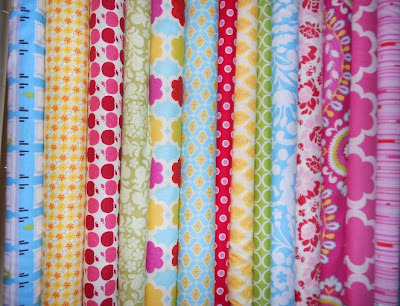 I just love all the bright happy fabrics especially on these very dreary winter days. So many lovely fabrics! Choosing would be difficult! I love the little pink huts on the bottom picture they remind me of Airstream campers! 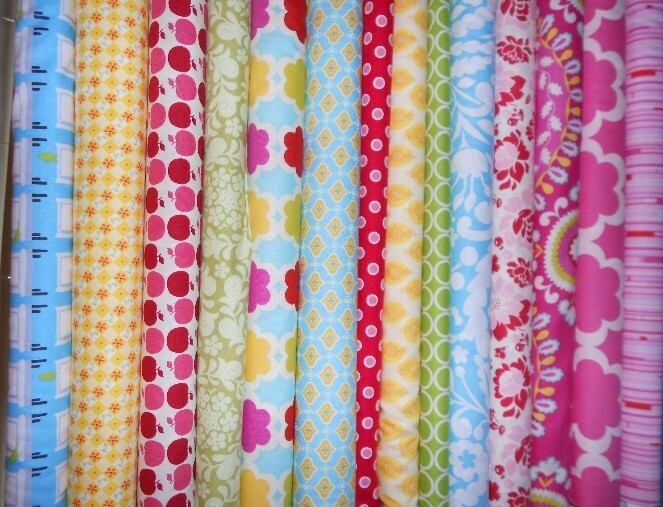 Wonderful fabrics, especially love the Pam Kitty Morning. So bright and cheerful. Thanks again for another fabulous giveaway. Comment on anything? I wish it would snow here. I'd love a day by myself in my sewing room. I'd love some of that half moon modern in my stash. Thanks for the giveaway! What a wonderful giveaway! I'd choose some dots, or appleville, or bird bliss.... man, this will be tough to choose should I win. Thank you fora chance! Do you hoard the apples in the basement because apples keep better in a dark, cool place? You're a hoot. Oh so many bright and cheerful fabrics on this wintery day. As always thanks for sharing with us. You are always so generous with your Giveaways! 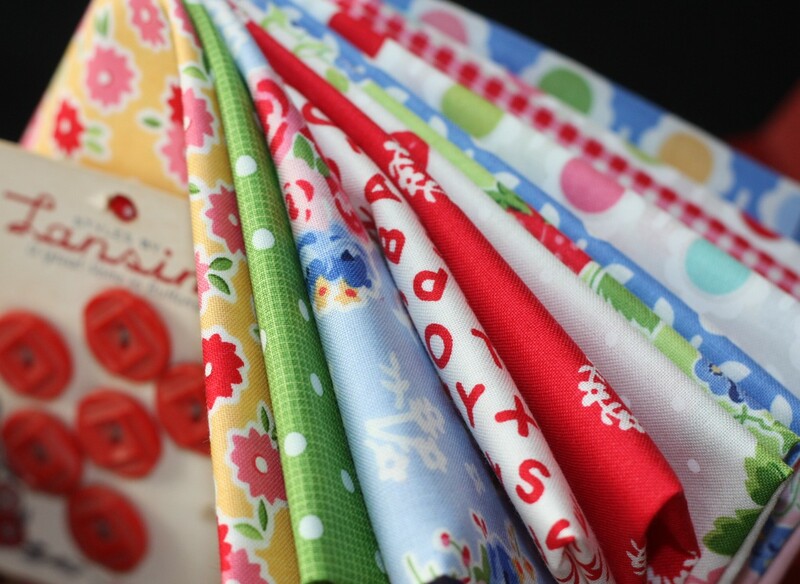 Thank you so much for sharing all these luscious fabrics! Once again a Fantastic giveaway!! Thanks for the chance!! Such pretty fabric...some of it way too pretty to cut into! :o) Please count me in. You are a temptress. Such nice fabrics and none of which I have. Thanks for the chance to have some! So many wonderful fabrics! It would be hard to choose just two! Thanks for a chance to win. Love the fabrics you're showing us today!!! They all look fabulous! Just looking at those pictures brightens my day! cute cute fabrics. thanks for the chance to win. So glad all the cute, springy stuff is coming out! I LOVE everything you've got up there! Thanks for doing a giveaway. I just love Thursdays! *random thought And I love fabric!!! Those were such pretty fabrics you featured! Thank you for offering this giveaway. wow! 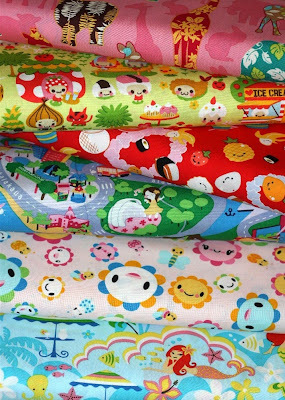 THESE ARE SOME REALLY BIGHT+CHEERY FABRICS! THANKS FOR THE GIVEAWAY TO SOME LUCKY QUILTER! Such beautiful fabrics. Thanks for a chance to win. boy, that's tempting! can you picture a little girlie party dress with all that ice cream? Yummy! those are smashingly yummy fabrics! thanks for the chance to win!! Those are soooo yummy !! Count me in! Love them! You guys always have a great selection of fabrics that I LOVE! Aww, those happy fabrics make me well... happy. Get's me all weak in the knees! Oh, how to choose from such wonderful fabrics! It is a dilemma I would love to have. Thanks for the chance to win some great fabric!! I'm just a beginner quilter and this new hobby is bringing out a side of me I haven't seen since I was a child . . . I'd love to have all of it! I could look at these beautiful fabrics all day long! Hmmm a random comment ~ I need to get sewing! :-) Thanks for the fun giveaway! I really want some half moon modern. Thanks for the giveaway! Wow. how generous. Any of these would be great additions to a quilt. love that half moon modern, too. always welcome the chance to win some ... thanx for the opportunity to do so. I have a "flood lost" community quilter coming to play with my fabrics, machines, threads - this bundle would be a thrill to give her to play with. I think some happy fabric would be great to work with and break up the winter duldrums. 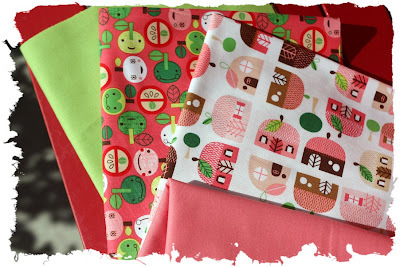 thank you for the chance to win some delicious fabric ... I love the whole Half Moon Modern line to bits ... I'd indulge in some of that ... no question! Oh, WOW! it would be so hard to pick.....but I'm willing to try! Thanks for the chance. I LOVE - especially the scissors from Half Moon Modern! Thanks for the chance! What great colors for a dreary winter day. Thanks for the chance to win. Todas son hermosas...y las tijeras :) !! they look totally yummy!! Thanks for the chance to win! Who doesn't love fabric--especially the chance to win free fabric? Thanks for the chance!! Thanks for the giveaway! Al of the choices are "happy" ones! Have a great weekend! I love these happy fabrics. Thanks for the giveaway! Random is one of my favourite words! What a great time of year for such cheery fabrics :-) A little cheer after the holidays! Such beautiful fabrics! It would be hard to choose! Thanks for the giveaway! love those fabrics.....all those smiling faces. Thanks! I got an ice cream maker for christmas! 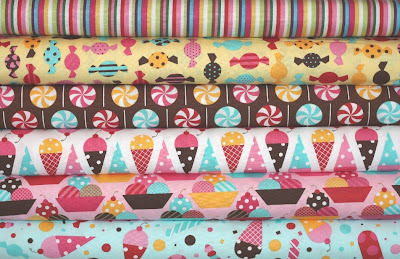 The ice cream fabric is sooo cute! oh yes...i'm sure i could easily find a project or two with any of those cute fabrics. fingers crossed. Also, thanks for getting my fabric to me so quickly that i ordered last week. love it. Nothing better than looking at fabrics! I get positively giddy. Beautiful fabrics! Thank you for the chance. Snip snip! 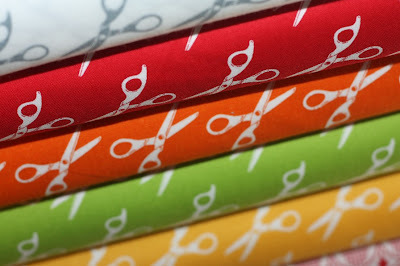 Gorgeous fabrics but just love those half moon modern scissors - thanks for another fun giveaway! Wow. They are all lovely. Thanks for doing this. So many wonderful fabrics- dreamy. Oh you do have lots of fresh fabric in those pretty, bright colors that those of us in winterland would love to dig into. Thanks for the chance to win. Love those apples, I'd hide them too! How would I ever choose just two half yards? There are so many lovely fabrics, I'm sure I could easily satisfy my fabric tastes. Thanks for the giveaway! Love the happy colors! Thanks for the giveaway! All those pretty colors sure cheer me up just looking at them! :) Thanks for a great giveaway! What happy looking fabric. Love it. Thanks for the chance. Random, huh? Hmmm...I learned that 83% of college students fail psychology 102 the first time they take it at my university. That's ridiculous. The instructors say that students don't know how to read. really. Any of your fabric would be wonderful. Our LQS closed and I don't get my fabric fix anymore. Thank you for the giveaway. You always have the best giveaways, love your blog. Thanks! Random comment....my feet hurt. Thanks for the give away! thanks for your giveaway. I'll use my random comment to thank you for your quick shipment on my latest order. I was drooling to get my pattern and it arrived fast!! The colors are perfect for spring projects! How about some Ruby in the shop?! Love them all on this page, too. Oh my goodness, great giveaway! 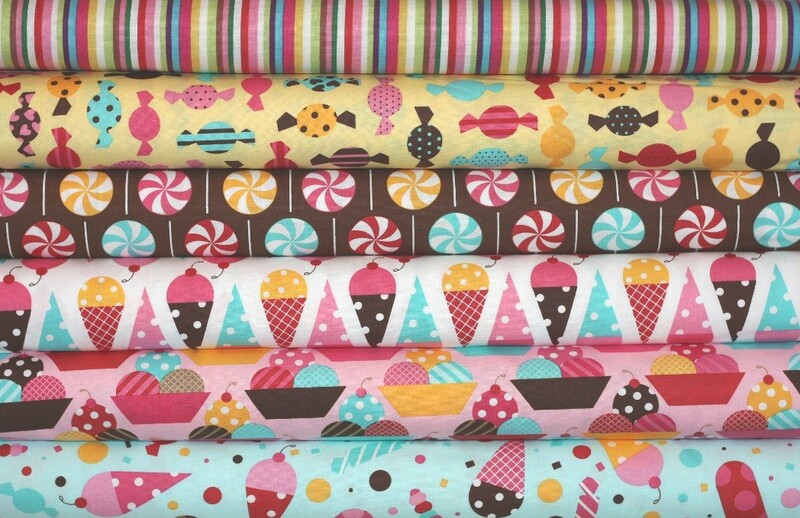 I love the "happy" fabrics! Love them all! They all look so good! How will I choose if I win!!!??? Love them all. Not sure if later tonight is already passed but I'll try adding my name in the drawing!